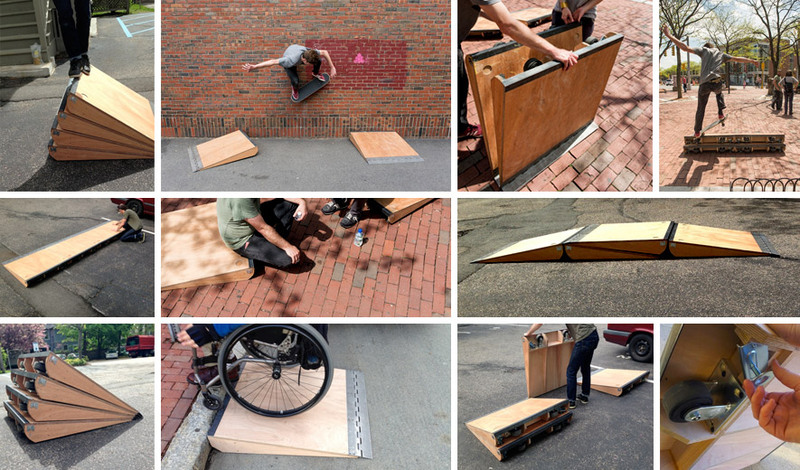 pretty ramp machine | Abler. Spend some time with Hendren and you’ll find yourself in a conversation that veers wildly between fashionable hearing aids, Braille tattoos, the design of space suits, the relation of curb cuts to gentrification, and the origins of the smooth curves of the Eames Chair in the lacquered wooden leg splint that Charles and Ray designed for the US Navy. Her own projects tend toward the informal and the temporary. She seeks out what she calls the margins of design: work that’s happening away from the spotlight of the mainstream tech and design press, “either because they’re made of low-cost materials, or in informally organized settings, or because they happen in the context of, say, special education.” Her low-tech approach allows her to intervene and launch discussions in graphic design, architecture, and prosthetics. Raul, I’m so glad you provided the links! A few weeks ago, someone did send me a photo of your prototype, and I really loved it — but I neglected to bookmark it properly. Please send me an email through the site if you’d like; I’d love to hear more about you and what you’re doing with this project.